There are mens dress shirts that you wear to the office and then there are Italian style dress shirts like this purple textured fabric model from Daniel Ellissa. This mens dress shirt is one you wear when you're on your own time. When you can express the style that you're made of. 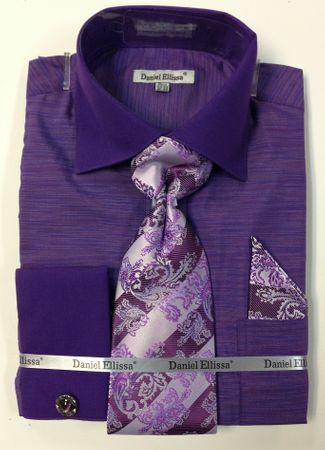 Featuring a texture style fabric with solid purple cuffs and collar with the matching tie set. Made of Cotton/Poly fabric.